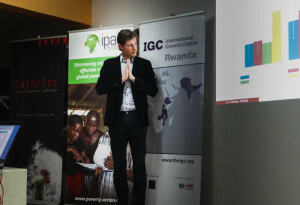 On March 26th, Laterite, Innovations for Poverty Action and the International Growth Centre hosted the 4th Rwanda Research Roundtable. The theme of the event was “Insights from Behavioural Economics” and it featured two distinguished speakers on the subject: Annie Duflo, the Executive Director of Innovations for Poverty Action and Leander Heldring, a PhD candidate in the Department of Economics at Oxford University. The event was held at The Office in Kiyovu and was incredibly well attended with upwards of 120 people coming out to participate in an engaging discussion. Heldring spoke first, presenting some results from his research on state capacity and tax compliance. Combining historical data about the Rwandan pre-colonial kingdom with behavioural games, Heldring’s research provides insights on how to increase tax revenues in low-capacity states. Expanding the tax base is a central concern in developing countries; in Rwanda for instance, only 14% of GDP is raised through taxes compared to 40% in the Netherlands. Heldring’s findings are based on one month of fieldwork jointly led by IGC and Laterite in rural Rwanda in November 2014. He first identified regions with high and low state capacity. He then asked participants play two behavioural games: a taxation game and a public goods game to study which form of incentives would lead people to give more money to the state, in both regions. His findings suggest that the efficacy of certain incentives appears to be very different across regions of high and low capacity. For instance, participants in low-capacity places tend to contribute significantly more to the public good when they are told what others have paid. This research provides interesting insights to aid in the design of tax policy in Rwanda. In addition to the presentations, attendees participated in two live behavioural games that demonstrated some of the challenges and benefits of cooperation for the audience. Check back soon for details on the next R3 event. The Rwanda Research Roundtable (R3) is an informal and anti-disciplinary forum for researchers, policymakers and practitioners seeking to advance the research agenda in Rwanda. The R3 is organized by Laterite, Innovations for Poverty Action (IPA) and the International Growth Centre (IGC). Participants are anonymously paired in groups of five to contribute to a public project. They decide to contribute as much as thy want to the project that yields a positive return for everyone.